Cry With Me is a mobile sorrow simulator. Try to hold back your sadness and the tears only fall faster. This was a solo project, made in an evening using GameMaker. Let's Cook Rice! 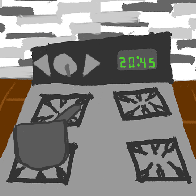 is a real-time stove-top rice cooking simulator. Add your ingredients to the pan, set your temperature, and wait for the rice to be cooked. The goal of this game is to check the rice when it is cooked, but before it has become over cooked. This game was a solo project made in GameMaker. 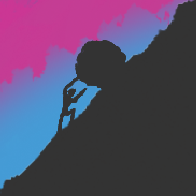 Uphill is a game based on the Myth of Sisyphus. Try to push the rock to the top of the hill without it rolling down. This was a solo project, made in GameMaker in about five hours. The Portland Oregon Trail is a one-player game based on the classic Oregon Trail game. This game was made for the 2017 Global Game Jam. I created the music, wrote the random encounters, and worked on much of the art. Team: Emily Jiménez, Simon Bielman. I created this game to teach myself to better use GameMaker. I took inspiration from the original Zelda game for the NES, with some dashes thrown in from Link to the Past and Link's Awakening. It was written from scratch in GML. 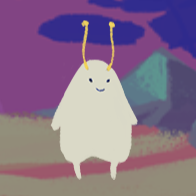 It can be played in the browser on itch.io. This is the first game that I created. It was built using Construct 2. I wanted to play with the idea of having the movement of the player create sounds that added to the soundtrack. I created custom music for the game, then created sound effects that would work within the same key as the music.